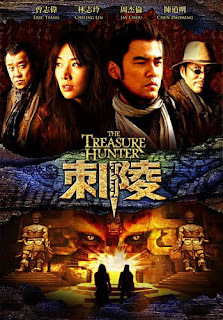 After watching The Treasure Hunter on the first day, I can only give a 3 star review. Not because I didn't enjoy the show. The show does have some entertainment value but the story makes you leave the cinema wondering why the earlier scenes were included. Besides that, we also couldn't figure out many things about the story. Somehow the parts do not seem to blend together at the end. 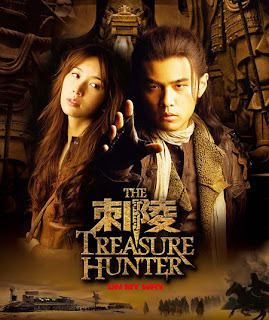 The story is about a young chivalrous man named Ciao Fei (Jay Chou) who, to save the life of his mentor's daughter Lan Ting (Lin Chiling) is forced to give up a map which is supposed to lead to a buried treasure of unbelievable riches. 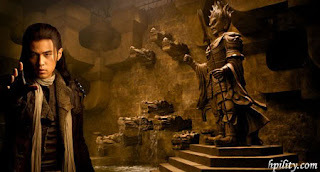 They embark on a dangerous journey to recover the map and fight to protect the ancient treasure. Along the way they meet other people, archaeologist Hua Ding Bang(Chen Daoming) and Pork Chop (Eric Tsang) who were also finding their way there for their own reasons. However,the overall cinematography and scenes were quite well done. It does satisfy my appetite for kung fu ballet (Matrix style and all) and special effects. We have some Indiana Jones stuff but very much less exciting and doesn't keep the audience thrilled at all. We have some Harry Porter magic but it doesn't fit in the story line, like they were just placed there for the special effects making the scenes rather out of place. There was a knight which appeared out of the sand when Ciao Fei hit a bell. After a short fight, the knight just crumbles into sand and thats the end of it. There was also a Bandage Guy (or Ribbon Guy, whatever you want to call him) who was quite bergaya when he appeared, shooting his bandages (or ribbons) form underneath his cloak. I thought he would be some tough rogue or something but somehow he just fizzles out. There is some humour thrown in, but even Eric Tsang, who despite doing a good job providing some laughs with his natural way, cannot save the movie. I wouldn't complain about Jay Chou's acting this time, I have to admit he is improving. He is quite natural in this movie, portraying a cool image. And we get to see more of his face with this tie-back hairstyle, instead of usually seeing his face half hidden by the fringe or the baseball cap. His fight scenes were quite well done, ada gaya. That is if we don't compare him with real action stars. There wasn't much for Lin Chiling to show in this role. Most of the time she is just there as the damsel the hero wants to save. Except for the one part where she had to act like a monster for a few minutes when she was possessed. Her role in Red Cliff did her more justice. On the whole, I would say the movie doesn't live up to our expectations. It does have some entertaining value, good for an evening out just to pass the time. If you're looking for a good plot or story or a touching movie, then don't go. If you just want some entertainment, go ahead. After all it is a light comedy action movie, not the real action movies or epic movies or slapstick kung fu movie. Anyway Jay Chou fans will still watch the movie, whatever the review.